The Firefly Music Festival returned to the Dover International Speedway June 21. I began my weekend at Firefly by leaving my house in Bucks County at 8 a.m., arriving in Dover, Del., at 10:30 a.m. to get in line for my camping assignment, seemingly with plenty of time to reach the festival by its start at noon. For the next seven hours, we, along with thousands of other patrons, sat in standstill traffic waiting for our assignments. Though Thursday night camping was available for an extra fee, I’d estimate that half of the ticket holders did not make it inside the festival before 6 p.m. Friday. The first band I wanted to see played at 4 p.m. Friday, and I was stuck in traffic that made it almost impossible to get there in time — until I had an idea. While my friend stayed in the car, I ran two miles up the highway with about 50 other people to catch Twenty One Pilots on the Backyard Stage. The one song that I did get to see, “Guns For Hands,” was completely worth all the running. The duo, Tyler Joseph and Josh Dun, put on an absolutely unreal show for each and every person watching. Their crowd involvement is unmatched, and they have a very unique drum solo, which they occasionally play from within the pit. Twenty One Pilots will be in Philadelphia in September with Fall Out Boy, and I definitely recommend checking them out. Next up was Calvin Harris. I am usually skeptical about seeing disc jockeys live because I feel as though all they have to do is push play on a computer, but Harris definitely proved me wrong. His set was so energetic; it was absolutely one of the highlights of the weekend for me. He was mixing some songs from the stage, and of course he played his hits “We Found Love” and “Feel So Close.” The only disappointing aspect of the set was when he played “I Need Your Love,” which features Ellie Goulding, yet he did not have her come out to sing it live. I know most of the crowd was also expecting Goulding because she played the festival a few hours prior. I closed out Friday night watching the Red Hot Chili Peppers play on the Firefly Main Stage. RHCP had been on my band “bucket list” after having been a fan of them for years, so I was extremely excited for this set. When I approached the stage, I quickly learned that I was not going to be able to see the band members because about 20,000 people were in front of me. None of that mattered once they hit the stage. Their live show was meant for that many people to see. Lead singer Anthony Kiedis owns the stage and demands the attention of anyone who can hear his voice. The crowd was completely captivated by the band as they serenaded us with an 18-song set including “Dani California,” “Otherside” and “Snow,” concluding with “Give It Away.” I definitely suggest seeing the Chili Peppers live if you ever get the opportunity! Saturday was my first full day at the festival, so I was able to see several performances, the first of which was Alabama Shakes. They definitely took the world by storm this year, and their rapid success made them a must-see for most Firefly attendees. Brittany Howard has such a raspy yet soulful voice that makes the band’s music seem like it’s from a different era. They are definitely a jam band, and they make you want to move your feet. Soon after, I ran to a smaller stage to see Chvrches, coming all the way from Scotland. Chvrches is a synth pop band made up of female vocalist Lauren Mayberry, accompanied by Iain Cook and Martin Doherty on computers. The performance was definitely something new for me. It was weird to hear so many different instruments and sounds come from a computer and then have the singer belt out the lyrics like there was a full band behind her. I had a great time dancing to their music, and it didn’t even matter that I didn’t know any of the lyrics because I was having so much fun. They closed with “Recover,” which I highly recommend adding to your summer playlist. I was looking forward to seeing MGMT later that night, but they just did not live up to all the hype. Instead of turning the songs on their CDs into an experience for their fans, they just played the songs note for note and seemed to lack passion. 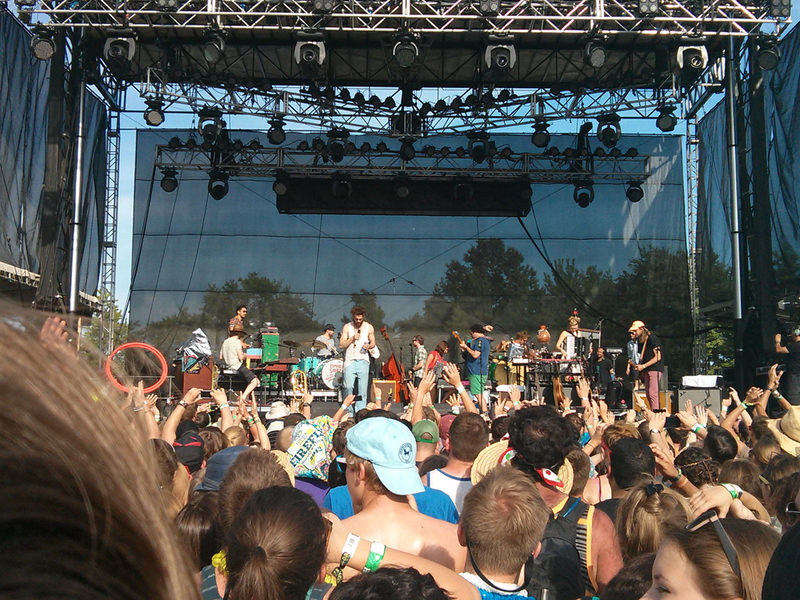 I was only at Firefly on Sunday for one thing: the return of Foster the People. It had been over a year since the trio had played a show in the United States, and I was ecstatic to have them back. They opened with two of my favorite songs “Helena Beat” and “Life On The Nickel.” They kept the talking to a minimum, but frontman Mark Foster shared a story about living in a dirty Hollywood hotel before playing a new acoustic song titled “Fire Escape.” FTP had the difficult job of getting sleep-deprived and unshowered kids to wake up and get excited, and they absolutely succeeded. They ended with “Pumped Up Kicks,” and the chorus of 20,000 people screaming the lyrics was a perfect end to the weekend. All in all, I had a great time. The lineup was awesome, the entertainment tents were innovative, the food and drinks were reasonably priced and the location was perfect. The only thing Firefly needs to improve on is its organization. Next year the campgrounds should open on Thursday night so guests don’t miss bands that they paid money to see, and the event organizers should not schedule similar bands to play at the same time. Firefly announced that the festival will return for a third run in June 2014, and tickets went on sale this week. See you next year at The Woodlands!